Zany, stick-in-your-head lyrics set to the greatest hits of classical music, filled with fact and fancy about the world\'s most notable composers and their masterpieces. Grammy Award nomination - 15 Awards. Also available: Beethoven\'s Wig 2,3 and 4. 4. Can You Can Can? Beethoven\'s Wig is the classical music sensation for the whole family! The brainchild of creator, lyricist, producer and lead vocalist Richard Perlmutter, Beethoven\'s Wig is zany lyrics set to the greatest hits of classical music. Filled with fact and fancy about the world\'s greatest composers and their compositions, Beethoven\'s Wig provides a fun foundation for classical music that will last a lifetime. The perfect blend of lunacy and learning, high brow and hijinks. The Beethoven\'s Wig series has won an amazing 40 national awards including three Grammy Award nominations, Parents\' Choice, NAPPA, Teacher\'s Choice, American Library Association Notable Children\'s Recording, iParenting Media, and the list goes on. Beethoven\'s Wig has been featured on NBC\'s Today Show, NPR\'s Morning Edition and All Things Considered, and XM Satellite Radio. 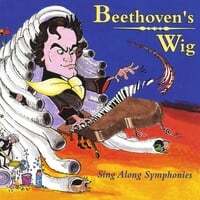 Beethoven\'s Wig performs live in concert at performing arts centers and with symphony orchestras across the country including the Baltimore Symphony, Reno Philharmonic and Billings Symphony. Canâ€™t tell Beethoven from Bach? Donâ€™t know if that great classical piece you heard is the 5th Symphony or Opus 500? Ever thought, â€œIf only classical music had a hook.â€ Well fret no more! Beethovenâ€™s Wig is here! Beethovenâ€™s Wig (sub-titled Sing Along Symphonies â€“ because thatâ€™s just what they are!) is zany stick-in-your-head lyrics set to the greatest hits of classical music. Each song is a hilarious look at the composer, the composition or the time in history. Fact or fancy, they are always fun. The perfect blend of inspired silliness and serious music, Beethovenâ€™s Wig provides kids and their parents with a memorable foundation for classical music that will last a lifetime. The same way that adults remember every word to their favorite songs growing up, Beethovenâ€™s Wig will inspire kids to remember classical greats and foster a genuine appreciation for classical music â€“ without their even realizing that all this fun is good for them, too. The package includes lyrics, quiz questions and activities. And as a special bonus, the CD also includes the orchestral performances of each song without lyrics so you can hear the pieces as the composers intended. â€œSilly lyrics cleverly draw in young listeners to the world of classical music in this high-spirited recording. This often goofy sing-along CD is a lighthearted way for young children to make acquaintance with popular classical works. Both vocal and instrumental versions of the recording\'s eleven songs are included.â€ Five Stars. Music made for children is often cursed by its limitations. It needs to be fun AND educational, but most writers can’t seem to strike the proper balance. Thankfully for us, Richard Perlmutter found what has been called “the perfect blend of inspired silliness and serious music.” SING ALONG SYMPHONIES, the first Grammy-nominated volume in the brilliant Beethoven’s Wig series, is a raucous and hilarious ride through music history. He chose some of the most memorable masterpieces from the Classical and Romantic periods and then set smart, witty words to those melodies. Penning lyrics to fit the fast and furious compositions (many of which were never conceived as vocal pieces) was no small feat. Each song’s subject matter is self-referential, illuminating something about either the composer, the tune, or the inspiration behind it. But Perlmutter reveals his true talents as an educator by delivering this heady material in a fun and catchy form that kids will love. The music is bouncy and bombastic. The cast gives lift to the lyrics with their dramatic, theatrical singing style, while also carefully avoiding condescension at every turn. It’s no wonder this zany collection is getting praised by everyone from NPR to U.S. News & World Report. We are all having a great time listening to the humorous and original lyrics. What a fun way to get kids interested in classical music! I am using this for kids that range from 1st grade to 7th grade. They all are having a wonderful time with the songs. What a great way to introduce the classics to kids in a fun and exciting way! !